Figure 1: Large-scale observatories associated with the GWF program. Refer to legend below for list of site names. The Columbia River basin originates in the southern Canadian Rockies at the Columbia Icefield in Jasper National Park. The basin is 668,000 km² and contributes more water to the Pacific Ocean than any other North and South American river. There are numerous hydroelectric plants located within the basin which account for a majority of hydroelectric power in British Columbia and ~ 1/3 of the hydroelectricity capacity in the United States. The Fraser River Basin encompases over a quarter of British Columbia and supports more salmon river runs than any other river in the world. The area of the basin is 220,000 km2 and is host to the longest river in British Columbia and 10th largest in Canada at 1375 km, the Fraser River. It supports some of BC’s most important commercial, recreational and aboriginal fisheries, three quarters of its value-added manufacturing, millions of hectares of forest, almost half of BC’s agricultural land, and many active mines. The Great Lakes – St. Lawrence Basin has a surface area of 1.6 million km2 and is the third largest in North America, after the Mississippi and Mackenzie rivers. The basin is the largest source of surface freshwater in the world - it contains over 21% of the world’s surface freshwater and is the primary water source for over 15 million Canadians and 30 million Americans. The five Great Lakes – Superior, Michigan, Huron, Erie, and Ontario – and the St. Lawrence River are bordered by eight US states and two Canadian provinces. The St. Lawrence River runs from Niagara Falls to the Gulf of St. Lawrence, passing through the provinces of Ontario and Québec. The river links the Atlantic Ocean with the Great Lakes and is among the world’s most important commercial waterways. The Mackenzie River in northwestern Canada is the longest river in N. America, and the 10th longest in the world. The Mackenzie River Basin (MRB) is approximate 1.8x10^6 km2 in size and discharge from the river is the largest N. American source of fresh water into the Arctic Ocean. The basin stretches from Jasper, Alberta at about 52°N to the Beaufort coast near 70°N. It is made up of six main sub-basins, three great lakes (Great Slave Lake, Great Bear Lake and Lake Athabasca ), and three major deltas. It has four major physiographic zones: an Arctic coastal plain, a mountainous Cordilleran region in the west, flat interior plains with myriads of lakes and wetlands, and to the east, the rolling to rugged Canadian Shield with thin soil mantles and a patchwork of lakes, wetlands and uplands. It is separated from the Pacific Ocean by the mountainous coastal regions of British Columbia and Yukon that act as an effective barrier to the moisture that is transported into the continent from the Pacific. Due to its northern location, about three-quarters of the MRB experiences no absorbed solar radiation for nearly three months of the year; much of the basin is snow-covered for 6-8 months of the year and about 75% of the basin lies within the continuous and discontinuous permafrost zones. Pingos and patterned ground features associated with continuous permafrost are found in the north, while agriculture and forestry are important economic activities in the southern parts of the basin. 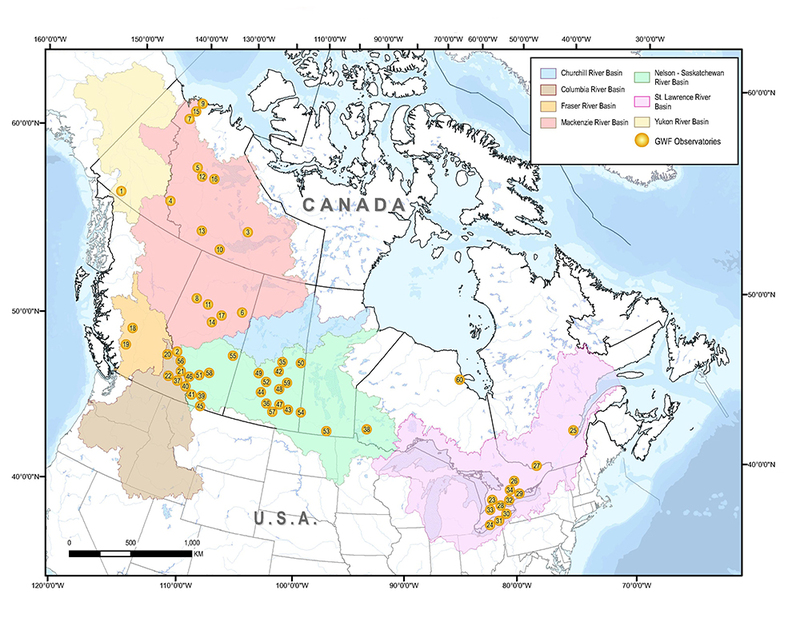 Because of the diverse physiographic features climatic conditions that characterize the basin, eight of Canada’s 15 major terrestrial ecozones can be found within the basin. Scotty Creek is located about 50 km south of Fort Simpson in the lower Liard River valley of the Northwest Territories and is 152 km2﻿. The landscape dominated by both discontinuous permafrost and peatland complexes - typical of the 'continental high boreal' wetland region. Typical of the southern extent of permafrost, Scotty Creek basin is coverd by 3-4 m of peat overlying thick clay and silt deposits that act to insolate patches of permafrost in the form of raised peat plateaus. The climate of the region is characterized as dry continental with short, dry summers and long, cold winter. The avearge annual air temperature is -3.2 °C and total annual precipiation is about 369 mm (46% of which falls as snow). Scotty Creek Research Station website. Baker Creek is located just a few kilometers north of Yellowknife, Northwest Territories, with a draining area of about 150 km2. Landscape is ~40% exposed bedrock with soil filling shallow depressions underlain by bedrock. The drainage network is a chain of lakes connected by short stream reaches and has very highly variable connectivity. Baker Creek is located in a zone of discontinuous permafrost. The 1971-2000 climate (Meteorological Service of Canada (MSC), Yellowknife A) is characterized by cool, short summers with average July and January temperatures of 17 °C and -27 °C, respectively. Annual total precipitation is on average 281 mm, with 42% falling as snow. The Trail Valley Creek (TVC) Research Station is located 50 km to the north of Inuvik, Northwest Territories, Canada. Research started at this site in 1991 and operates from April to September. TVC drains 58 km 2 of tundra, with patches of shrubs and boreal forest, and is underlain by ice-rich continuous permafrost. This area is one of the most rapidly warming regions on Earth, with melting of ground ice, expansion of shrubs, thinner snow covers that are melting earlier in the spring, and changes in runoff. This research is complemented by observations at the Havikpak Creek (HPC) Research watershed located 50 km to the south, and is primarily forested. Due to the rapid changes in this environment, there is an urgent need on the part of territorial and federal government agencies, NGOs, Aboriginal communities and industry to understand how the changing climate is impacting their shared water resources and ecosystems now and in the future, and to transfer this knowledge to all Canadians. See Trail Valley Creek Research Station brochure. The Daring Lake Tundra Ecosystem Research Station (TERS) was established in 1994 as a multi-purpose facility to facilitate long-term research and monitoring of the tundra ecosystem. The station is located in the Southern Arctic Ecozone 50 km north of treeline. The research station is a model facility using solar and wind power. It also uses the latest techniques in waste management and bear deterrence. TERS operates as a cooperative with many partner organizations. The Nelson-Churchill River Basin is the third largest watershed in North America, with a drainage area of more than 1.4 million km² . The Nelson River receives water from Lake Winnipeg and flows through northern Manitoba to the Hudson Bay. The Churchill River flows through parts of northern Alberta, Saskatchewan and Manitoba, with a portion of flow being diverted into the Nelson River at Southern Indian Lake, Manitoba. The Nelson-Churchill River Basin is heavily influenced by hydroelectricity generation and related development in the region, as well as the potential impacts of climate change. While the region has seen significant changes in its water systems over the past several decades, the northern NCRB provides water, food, jobs, tourism opportunities, recreation and significant inputs into the Canadian economy. Marmot Creek Research Basin was established as an experimental basin in 1962 by the Governments of Canada and Alberta, as part of the International Hydrological Decade. It became an outdoor research laboratory to investigate the principles of mountain hydrology and the influences of forest management on streamflow generation, under the leadership of the Canadian Forestry Service. This program was closed down in 1986, on development of the Nakiska Ski Resort. In 2005, the basin was reactivated by the University of Saskatchewan, University of Calgary and Environment Canada: since then it has supported a wide variety of research in process hydrology, climatology, ecohydrology and hydrological modelling, underpinning the next generation of models and forest-management strategies. Marmot Creek Research Basin website. The Columbia Icefield forms the hydrological apex of North America, with outlet glaciers flowing into tributaries of the Saskatchewan, Columbia, and Mackenzie River systems, which drain to the Atlantic (Hudson Bay), Pacific, and Arctic Oceans. The Columbia Icefield is located within both Banff and Jasper National Parks, and is the largest icefield in the Canadian Rockies with an approximate total surface area is 205 km﻿2 (in 2009). Climate is characterized by long winters and and short summers with mean annual temperature is -4.0 °C and total annual precipitation is about 1277 mm. Low temperatures at the high elevations of the icefield plateau cause most precipitation to fall as snow. Peyto Glacier is located near the continental divide in Banff National Park, Alberta. The research area is approximately 24 km2, is located at 2100 to 3150 m elevation and is mostly covered by Peyto Glacier. The glacier-fed Peyto Creek flows into the Mistaya and North Saskatchewan Rivers. The glacier has undergone considerable negative net mass balance, downwasting and terminal retreat over the past 50 years. A glacier mass balance program was established at Peyto by the Government of Canada in 1966 and operated by Environment Canada and now by Natural Resources Canada. The site remains a focal point for a wide range of glaciological and hydrological research and reports to the World Glacier Monitoring Program. Sibbald Research Wetland is located in Kananaskis Country, Alberta in the front ranges of the Canadian Rocky Mountains, and is a 0.63 km2 valley wetland with substantial peat deposits. The peatland is drained by Bateman Creek, a tributary of Jumpingpound Creek, which flows into the Bow River. Beavers are active throughout the peatland, and a number of different sized beaver dams and ponds exist. Beaver dams impede upstream flows and flood adjacent riparian areas. Ponds created by beaver dams function as efficient sediment traps, filling with sediment and organic materials, which can remain in the pond area even after dams are abandoned. Once abandoned, dams degrade and the water table recedes, leaving behind a “beaver meadow”, which becomes buried by more peat. The Boreal Ecosystem Research and Monitoring Sites (BERMS) are located in the southern Boreal Plains of Saskatchewan. Originally part of the Boreal Ecosystem and Atmosphere Study, the BERMS project began in 1996 and was operated and funded by Environment Canada, Natural Resources Canada and Parks Canada until 2012 when the Global Institute for Water Security took over the operation and funding of select sites. The goal of the institute program at BERMS is to improve understanding of the interactions between climate, hydrology and vegetation in the southern boreal forest, and the sensitivity of the ecosystem to climate change. The main sites within BERMS are mature Jack Pine, Black Spruce, and Aspen stands, as well as Fen, and reference stations in nearby burned and cleared forest stands. The monitored area also covers a number of watersheds in the southern Boreal Forest, including White Gull Creek, Torch River, Garden River and White Fox Creek. Four of the active flux towers used to measure the energy, water and carbon balance between land and atmosphere are located within or near the gauged White Gull Creek watershed. This provides a valuable test bed for the institute to develop and evaluate coupled hydrological-ecological models. Brightwater Creek, located near Kenaston, Saskatchewan, in a flat and typical agricultural area. This site provides a focus for hydrological and land-surface modelling and the study of land-atmosphere feedbacks from different agricultural land use and land management practices. Scientists have installed instrumentation to monitor spatial soil moisture, groundwater and land-atmosphere interactions at multiple scales. This research is in collaboration with Agriculture and Agri-Food Canada, Environment Canada and the University of Guelph and is a test-bed for NASA"s SMAP soil moisture remote sensing mission. Buffalo Pound Lake is a eutrophic reservoir in rural Saskatchewan which provides drinking water to residents of the cities of Regina and Moose Jaw (25% of the province's population). The lake is susceptible to algal blooms, which may increase in frequency due to high nutrient loads, and warmer weather. Water treatment processes and costs are significantly affected by lake ecology. The Buffalo Pound Water Treatment Plant relies on expensive advanced treatment processes to ensure high quality finished water, and help eliminate taste and odour caused by algal blooms. Researchers are developing models to provide early warning of conditions likely to lead to harmful algal blooms, or warn of major changes in lake chemistry which could affect drinking water treatment. Results will benefit the local water utility and water users, and aid in the management of other bloom-affected waters and surface water supplies. Researchers are working closely with plant managers and the Saskatchewan Water Security Agency to ensure research outcomes align with management and policy-related objectives. Lake Diefenbaker is a 200 kilometer long reservoir in Saskatchewan that provides drinking water for 25 per cent of the province's population, as well as being an important source of irrigation, hydroelectricity and recreation. However, there has been little baseline knowledge or historical data on the reservoir as a whole when it comes to ecosystem health. A research program was established at Lake Diefenbaker by the Global Institute for Water Security, U of S in 2011 to understand how the reservoir has changed since its formation and to identify stressors affecting its water quality. GIWS is working with researchers at the Universities of Regina, Waterloo, Minnesota and Oregon, and the Saskatchewan Water Security Agency. Located in eastern Saskatchewan within the Aspen Parkland sub-basin of the Assiniboine River, the Smith Creek Research Basin is approximately 435 km2 and characterized by prairie pothole topography, with numerous isolated wetland areas with little or no surface inflow/outflow. the basin was established in 2007 by the Centre for Hydrology, U of S with funding from Agriculture and Agri-Food Canada, Prairie Habitat Joint Venture Committee, Prairie Provinces Water Board, Manitoba Water Stewardship, Saskatchewan Watershed Authority and Ducks Unlimited Canada. In the past 50 years, the basin has undergone rapid changes, transitioning from areas of extensive woodland and wetlands to grain and oilseed cultivation. From 1958 to 2001, there has been a reduction in wetland areas from 17% to 9%. Smith Creek is being studied to understand the effects of land use changes and drainage on eastern prairie hydrology, flooding and drought, and to develop a hydrological model for predicting these changes. 2014 June report showed that re-establishing wetlands may decrease flood damage. The St. Denis National Wildlife Area is a 361-hectare area that was established by Environment Canada in 1968 to monitor the effects of agricultural activities on wildlife habitat. Located about 40 km east of Saskatoon, the landscape is characterized by numerous closed-basin wetlands, known as prairie potholes, and a rich diversity of plant and animal species. Since 1980, a number of research initiatives have been carried out, including investigations of waterfowl and habitat, hydrology and soil science. The site has a long record of data collection and scientific study and provides an excellent opportunity for integrated research on the effects of land management and climate change on the hydrology of the prairie landscape. The Swift Current study site consists of three adjacent, 5-hectare instrumented experimental plots in the semi-arid, agricultural region of southern Saskatchewan. The site (near Swift Current) was established by Agriculture and Agri-Food Canada’s Semi-arid Prairie Agricultural Research Centre in the late 1950s to research the effects of agricultural land management practices on runoff water quality, chemical transport and soil erodability. The plots are instrumented with edge-of-field surface runoff monitoring. They have a long record of data collection associated with the runoff amount, water quality, land management practices, precipitation, soil characteristics and climate observations. Tobacco Creek is a 1,000 km2 subwatershed located in south-central Manitoba which is part of the agriculture-dominated drainage system of the Lake Winnipeg Basin. It is one of the most data-rich watersheds in Canada, where more than 20 years of research has been targeted to understanding effectiveness of several BMPs. The research has been facilitated by government scientists and university researchers from across the country in cooperation with the Tobacco Creek Model Watershed – a group of stakeholders (community members, farmers, agriculture industry, and government) and scientific researchers. The watershed is an ideal environmental laboratory for GIWS development of coupled hydrological-biogeochemical models for quantitative assessment of BMP effectiveness, and for testing agri-environmental indicators. The Saskatchewan River Delta is the largest inland delta in North America and is a complex series of abandoned and active river channels, lakes and wetlands that straddle the Saskatchewan/Manitoba border. The upper delta is largely comprised of the Cumberland Marshes, and is one of the most biologically diverse habitats in Canada with an abundance of fish, waterfowl and game. Over 15,000 people live in the region - the majority in First Nations communities – and many rely on hunting, trapping and fishing for their livelihoods. The region represents the culmination of water diverted and used in the Saskatchewan River Basin. Annual flows have decreased by around 30% since the turn of the last century, partly due to dams such as Gardiner and E.B. Campbell holding back water. The implications of these changes in flow for the production of fish, waterfowl and mammals that depend on aquatic habitat are being addressed by an institute research team. The research helps communities in the delta understand how climate change and water resource development may affect the local habitat and plan for ways to ease the impact to their livelihoods. The Saint John River Basin runs primarily through New Brunswick and parts of Quebec. It drains approximately 55,000 km² and is regulated by four hydroelectric dams. It is one of hte largest river basins in eastern North America. The Yukon River Basin flows northwest from the Coastal Range mountains of northern British Columbia, through the Yukon Territory and Alaska to the Bering Sea. The Yukon River Basin is 850,000 km² in area and is the fourth largest basin the North America. Wolf Creek Research Basin is located near Whitehorse, Yukon within the Upper Yukon River Basin. It is representative of much of the interior Subarctic Cordilleran landscape and drains roughly 200 km2 in area with an elevation range of approximately 1300 m. Surface landcover consists of dense Boreal Forest at lower elevations, sparse forest, open meadow and shrub tundra at the higher elevations, and exposed alpine areas with mostly bare rock at the highest elevations. There are no glaciers in the basin, but there are a number of perennial snowdrift areas on leeward slopes at high elevations. See the information brochure on the changes being observed at Wolf Creek. More information on Wolf Creek at the IP3 website.